Every eCommerce site needs to focus on providing the best experience for its customers. Providing advanced search options is one such aspect that would rank high in terms of good user experience on your site. Product search options are relatively not a hassle if yours is a store with just a handful of products. However, when the number of products and categories increase, you need to provide advanced search options for users to find the exact products they are looking for. 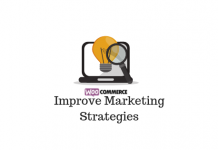 In WooCommerce, this can be achieved by utilizing specific extensions for product search. This article lists out some of the best WooCommerce product search plugins for your online store. After reading this article, you should also understand how optimized product search options play a major role in customer experience. Customers on your store would love it if the product search is bringing instant results. 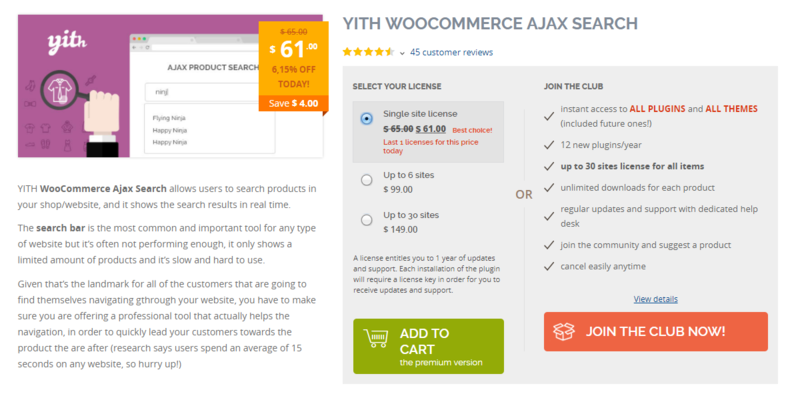 This WooCommerce extension offers to help the product searches more relevant and fast. This is by using a logic to enhance the relevance of products in search results. The search keywords are given different weight based on their presence in the title, descriptions or tags. There are advanced controls that would help to improve the relevance of products and categories in searches. 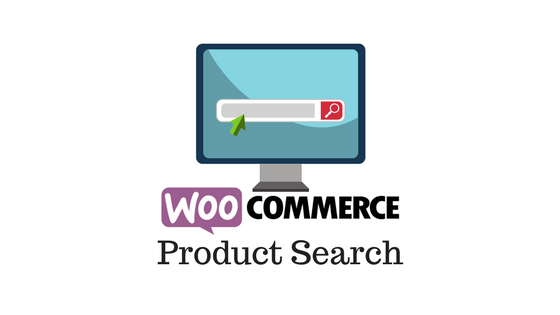 WooCommerce Product Search extension makes product searches faster and more relevant to your store. The extension also offers instant results functionality, where relevant product names are displayed in the searches while the users are still typing their keywords. As a result, your customers can find the products they are looking for much faster than otherwise required. In addition, the extension offers you the flexibility to place the search option anywhere on your site. 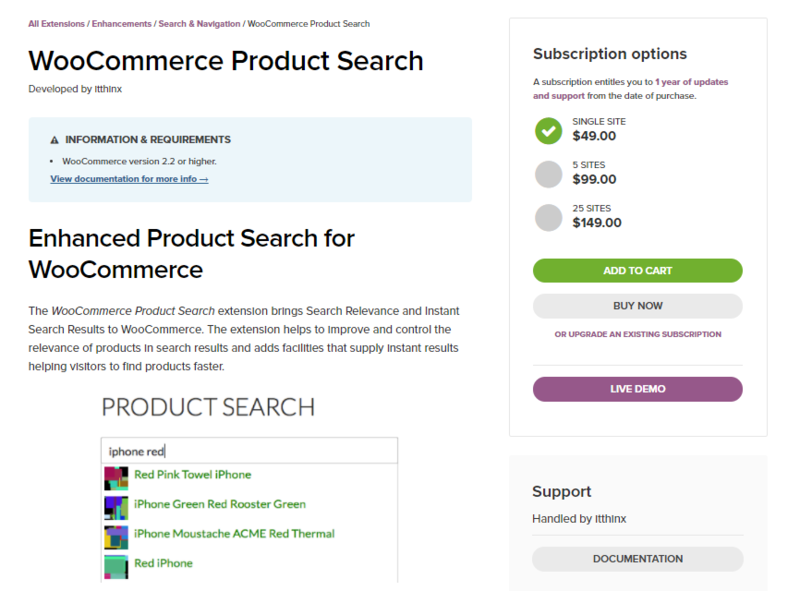 Overall, WooCommerce Product Search extension helps you refine the search functionality on your site by assessing the relevance of the typed keyword. This free plugin improves your search functionality by adding Ajax powered instant search results on your WooCommerce store. Basically, when customers enter a keyword in the Ajax powered search box, it will provide suggestions for relevant products from your store. In fact, this will instantly help customers to not waste any time in searching for products. Customers are spared from the tedious process of browsing through multiple menus and categories to find a product. Overall, this increases the prospects of sales and conversions on your store. 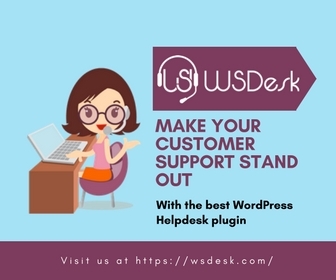 The plugin helps you to add the search form anywhere on your site with the help of widgets and shortcodes. Moreover, this plugin gives you the flexibility to customize the search form according to your preferences. And, you can control how to display the search results as well, by setting a minimum limit of search characters and a maximum number of search results. This premium plugin offers quite a few features that would help you to provide the best functionality to your search feature. It provides you an option to show an image of the product in the search results. And, you get the control to decide where to show it on the form. The plugin also gives you an option to add the description and price of a product in the search results. This will be especially relevant when there are discount deals going on in your store. Moreover, you can add a label to grab the attention of customers to products on sale. Furthermore, you can allow the users to apply filters in their searches using categories, tags, etc. and, you will get to use two different layouts for the search form. This plugin gives you an advanced search option on your WooCommerce store. Your customers can search for your store using product categories and tags. In addition, there is the shortcode option that would help you place the search form anywhere you want on the site. The plugin also offers several filter options for the searches. These include Title, Date, Price along with ascending and descending options. This free plugin offers the live functionality feature in your store. It also allows a search based on various parameters like title, description, categories, tags, etc. And, you can place the search form anywhere on the site using a shortcode. Moreover, it offers an option to display product image and price in the search results. If you store has only 100 or fewer products, you can use this free plugin. This cloud-based plugin provides instant search results to your WooCommerce store. It really speeds up the search process on your site, and as a result, increases the chances of conversion on your store. Search term auto-correction, visual highlighting, etc., are some of the advanced features of this plugin. This is a great option if you have only less than 100 products in your store. How to enhance product search in your store? Product search is one of the most important aspects of an eCommerce store. It is through the site search that prospective customers find the products that they are looking for. As a result, product search becomes one of the most important determinants of sales and conversions. It is quite possible that you think product search is a straightforward process. However, in eCommerce, time is the essence, and shoppers don’t always have the patience to type out everything accurately. Anyway, as a shop owner, it is up to you to guide all prospective customers to the relevant products, whether they are patient or not. That is why modern search algorithms come loaded with multiple features to handle misspellings, plural queries, synonyms, etc. So, this way you are making sure the customer lands on your product page even when he/she types the name of the product with a different name or spelling. Furthermore, advanced search tools use multiple parameters to employ search relevance to connect customers to products. For this, machine learning can be effectively used to optimize search relevance. However, one important aspect is to upgrade your search functionality continuously. eCommerce is a dynamic domain where technology and user behavior change rapidly. And if you don’t upgrade your search functionality promptly, there are chances that you might be left behind. It is more likely that some users are using long tail keywords to find products in your store. Now, the natural assumption would be a long keyword will be more specific, and provide more relevant search results. However, if you have not refined your search functionality, search tool might return several products based on each of the single words in the long tail keyword. This would mean disaster in terms of specificity on searches. A great way to tackle this is to use ‘AND’ separators in the search. So, if a customer searches with a long phrase connected by ‘AND’ separators, naturally there will be more relevant results. Another great way to provide more relevant search results is to anticipate possible misspellings of your products and include that in the search logic. You can provide multiple spelling variations of a product so that searches with all those spellings lead to the product. Examples for this would be using both numeric and textual equivalents, alternative spellings of common words, etc. Auto-suggestion is commonly used by leading eCommerce sites to guide customers to the right product. This gives the site owner a lot of possibilities to present several products in their store. So, when a customer is typing the search keyword itself, he/she gets an idea of what all products are available in the store. A good keyword research should be the base of your product search strategy. Keyword research can be a necessity in search engine optimization, but you can also use effectively to refine your product search process as well. Naturally, it will help you include alternate spellings, synonyms, etc., in your search logic. In addition, you can search on competitor’s sites to get all the relevant keywords related to a product. And, you can use this data to refine your store’s product search as well. You need to consistently examine how your search tools are functioning. Experts advise doing a manual analysis of your search results. This will give you a better perspective to understand how the existing search tools are performing. The most important criteria would be to understand if the returned results are all relevant. You can check if all the additional search settings that you applied are returning relevant results. If your current search is not returning results as estimated, then it might be time to rethink your product search strategy. Thankfully, there are plenty of tools to set up a robust product search strategy on your WooCommerce store. Some of the plugins discussed above can provide advanced logic to properly return results by channeling search relevance appropriately. Until now, we have discussed how you can make search results accurate to provide appropriate results to customers. Another important aspect here is how and where you place the search box. If the search box is only available in one corner of the home page, it might be difficult for customers to come back to it every time they want to search something. A good way to tackle this would be to place the search box in multiple locations. For example, you can place a search box on every product page. This way, if a customer can quickly search for one product while checking out another. 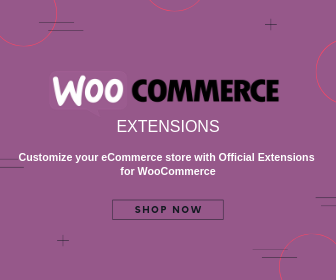 Most of the WooCommerce solutions we discussed in this article offers shortcode option to place the search box in multiple desirable locations on your site. If your search box is kept in a manner tough to spot, there are chances that your customers might miss it. The trick here is to keep the search box in a distinguishable way. This doesn’t mean to include flashy elements that go against the overall visual language of the store. However, a slight design modification or color coding can take it a long way. If the customer is not able to recognize the search option, they might use other elements in your store like the category menu for product searches. This might lead to some frustration among customers, as sometimes the category structure can become quite complicated. While designing the search box, there might be a tendency to leave it really small. This might be in accordance with the overall design of your site or other aesthetic considerations. However, if it is not able to function in the desired way, then it becomes a wasted effort. Sometimes, your products have bigger names when the SEO title mentions attributes as well. And, when a customer tries to type the full name, a small search box might prove inadequate. If half of the text is hidden while typing, you would naturally feel an annoyance. This definitely can leave a bad taste in your customer’s experience. Even if it seems like a trivial issue, such minor things can lead to some definitive bad vibe on your store. Across the world, eCommerce businesses are gathering steam. As a result, minute aspects of a website and its functionalities are analyzed and discussed in more detail. This is all the more evident from the fact that new tools and solutions are coming to the market on a regular basis. 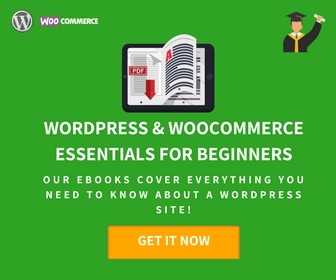 WordPress WooCommerce community is quite prompt in providing cost-effective solutions to advanced functionalities. WooCommerce product search is one area where you can try out several solutions to provide the best search results for your customers. This article has listed out some of the best WooCommerce Product Search plugins that you can try out on your site at the moment. Some of these are free and some are premium. Based on your business strategy and product range, you should choose an appropriate one. I would suggest SearchIQ for several reasons. But the top ones are the features, customization options, and price point. I found it very easy to install and it’s really customizable as mentioned on their website. Free version fits great for my site as I don’t really need facet or cross search or PDFs. But if you need the pricing is quite less compared to Swiftype or Relevanssi. Try the free version if you need best search results and don’t have over 2k posts/pages on your site.